A project is underway at The Royal College of Surgeons of Edinburgh (RCSEd) to preserve and catalogue the College’s institutional records and those of associated bodies. For five centuries, the RCSEd has enjoyed an international reputation as a provider of the highest standards in surgical education, training and clinical practice. Generously supported by the Wellcome Trust’s Research Resources in Medical History, the project will facilitate wider access to historians of Scottish medicine, surgery and medical education. This is an exciting time for the Heritage Department at RCSEd (Library and Archive and Surgeons’ Hall Museum) as the Wellcome project coincides with the Lister Project supported by the Heritage Lottery Fund, which has recently commenced at the College. The RCSEd historical records comprise a unique historical resource detailing the activities, culture and development of an ancient craft guild across 500 years. 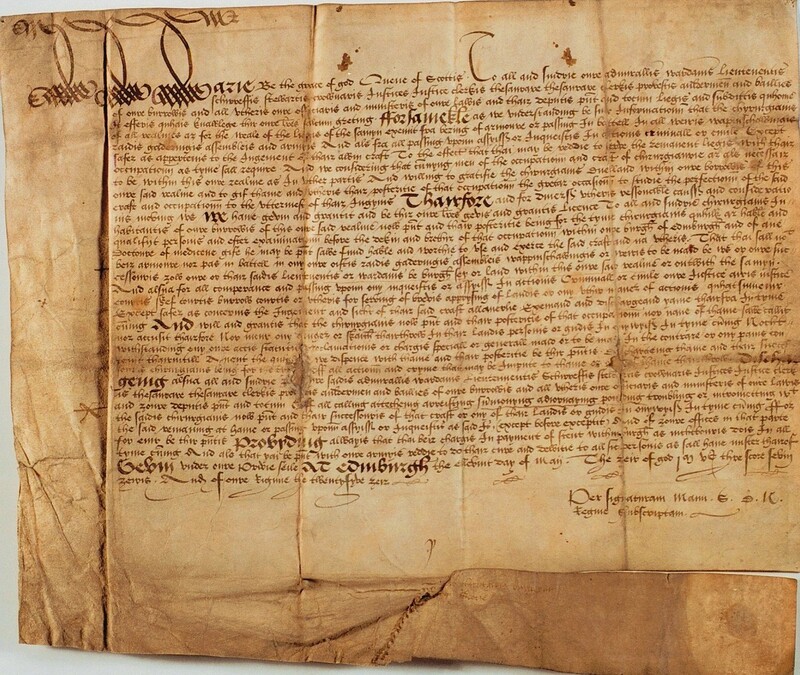 The institutional archive, dating from the early 16th century is rich in all aspects of the College’s illustrious history, including this early letter of exemption granted by Mary Queen of Scots in 1567, which served to relieve surgeons and barbers from bearing arms. As cataloguing progresses, descriptions will be made immediately available through our website and the Archives Hub. Check back regularly to the blog for project updates and highlights from the Library and Archive.